The fantastic March My Monthly Hero kit arrived yesterday and I got to work right away. 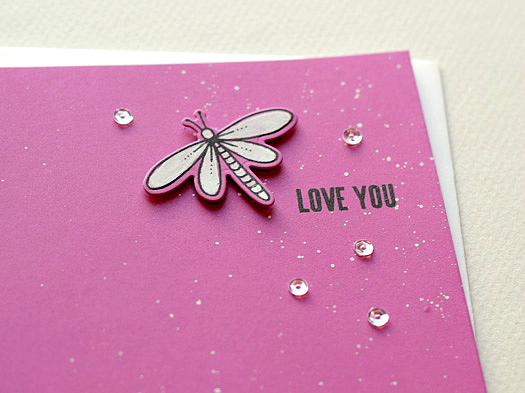 I'm a slow stamper, but that dragonfly got me thinking. I used Winsor & Newton Designers White Gouache to get the white dragonfly. This is pronounced "gwash." At least I think it is. Plus it has the word Designers in it, so it must be good, right? 2. Mix a tiny amount of the gouache with a tiny amount of water and paint over the wings and body. 3. Let dry (a few minutes). 4. The black details on the wings and body are now lost under the opaque gouache. But we have tricks to fix that. 5. Stamp the image with the Hero Arts Intense Black ink again. It will stamp right over the gouache, and voila, a white dragonfly with all the black lines will be back where it belongs. The gouache also makes awesome white speckles on colored cardstock. Added sentiment from Hero Arts Many Everyday Messages and a few sequins. Amazed by the way you were able to catch my attention with this pure CAS design Joan! Color magic I believe! You are such a fancy designer with your gouache. hee hee! 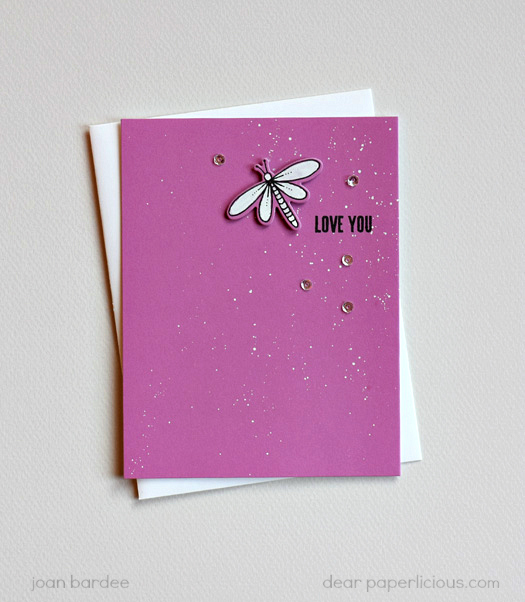 Really love this - and super smart tip to use a MISTI and stamp again!! Oh my, my, my, my!!!! This card is wonderful magic! Love everything about it....thanks for the inspiration! Love it! Such a cute dragonfly. That cardstock is really a great color. Thanks so much! And, you are a really bad influence - I broke down & ordered this darling kit! Such an eye catching design, Joan!! Those white wings and wee speckles are beautiful on the pretty raspberry background!